Yesterday evening I carefully counted the pages in the next chapters to revise: 4 in Chapter 26 and 7 in Chapter 27. Short, so easy and enjoyable. No feeling of having to rush. I retired to bed happily anticipating the next day. It is like reading a new novel, as I’ve forgotten what I wrote all those years ago in my first draft. I didn’t have time then to go over the later chapters, so I don’t have to decipher squiggles of ink as I did in the early ones. The next revision will be more tedious, without the sense of discovery and saying to myself, ‘Did I really write that?’ There’ll be even more snags that I’m noting now. So this morning I settled down, confident I would complete the task I had agreed with myself. I looked out of the window to see if the weather was behaving itself and noted the snowdrops around the silver birch are out, the first intimations of spring. Satisfied, I lowered my head to concentrate on pages I and 2. 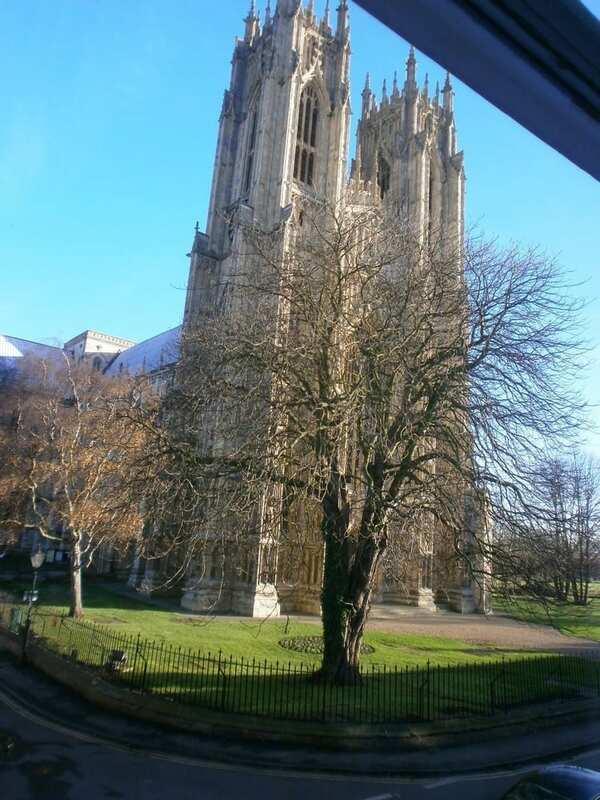 Before turning to page 3, I leant back and noticed a movement high up by one of the pinnacles of the Minster’s right tower. My head began to turn at the very thought of a human up that high, looking down – at me? Unlikely. As a child, I had no problems whirling round the Great Wheel at Fairs. Later on in my teens I began to feel the fatal pull of the ground and only looked down from on high if there was a stout wall between me and the void, however stunning a view spread out before me. Whew! What amazing nerves as well as skill those two steeplejacks up on the Minster tower must have. They are both wearing that phosphorescent yellow jacket and one has red trousers. He is standing between two pinnacles coiling rope, and there’s nothing in front of him, nothing between him and space. I seek refuge in pages 3 and 4, finish the chapter, make changes and note pitfalls. Some straightening out to do. Now to the longer chapter. I look up to find out what is happening to the rope. It’s hauling up bags – cement? More coiling and throwing of rope to someone hidden behind the pediment between the towers, the typical classical shape that fronts a pitched roof. Steel poles swing up, and I feel guilty of neglect. Chapter 27, pages 1, 2 and 3 are carefully scrutinised, snags dutifully noted and improvements made in style and tone. I want to read on but something pulls my head up to look out. There a plank is dangling, followed by another and another; men leaning over into space, dangling ropes and hauling them up, just as their predecessors did centuries ago. The men have built out a platform and haven’t even taken a break when I abandon Chapter 27 unfinished to go to the kitchen for lunch and the one o’clock news. No time to finish them as other jobs planned for the afternoon. I’ve left a few more slabs in hell, paved with good intentions.